North-East England is one of the nine official regions of England and includes the combined area of Northumberland, County Durham, Tyne and Wear and a small part of North Yorkshire. The highest point in the region is The Cheviot, in Northumberland, at 815m and the largest city is Newcastle. 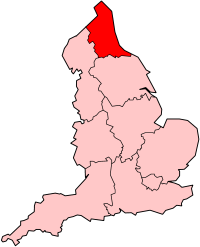 Sunderland is the second-largest. The region is known for its urban centres and for its natural beauty: Northumberland National Park, the region's coastline, its section of the Pennines and Weardale. It also has great historic importance. There are two World Heritage Sites: Durham Cathedral and Hadrian's Wall. 11. Redcar and Cleveland U.A. This page was last changed on 23 June 2016, at 00:44.